Scientists at the John Innes Centre have discovered how plants send internal warning signals in response to attack by aphids. They found that when the insect feeds on a leaf it triggers the plant to admit calcium into the damaged cells. This small flux of calcium prompts the plant to signal that an attack is underway, and a larger amount of calcium is then mobilised from within the cell. These discoveries were the result of a collaboration between Professors Saskia Hogenhout and Dale Sanders. Professor Sanders elaborates on the findings: "We now know that when an aphid feeds on a leaf, the plant uses calcium as a warning signal. This signal forms part of the plants defence mechanism. By understanding this, we are one step closer to understanding how we may be able to reduce the damage done by pests such as the aphid." The research groups used electrophysiological monitoring and a genetically-encoded fluorescent reporter of calcium to show that small elevations in plant calcium were found around the stylet penetrations sites of the aphid pest during the first stages of its attempt to establish a long-term feeding site. They combined this knowledge with evaluation of the genetic response to determine that the elevation of calcium was dependent on specific plant membrane channels. It is well known that calcium ions increase in plant cells in response to stimuli from their environment. Before this study is was unknown if this happened as a response to aphid feeding or if the plant used the calcium as a warning signal following aphid attack. 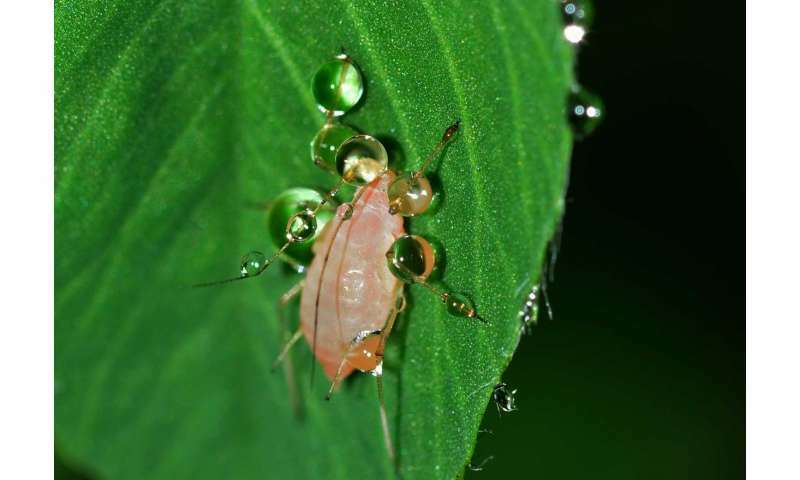 Aphids are a major pest of crops, vegetable, fruit, and ornamental plants. Understanding how plants respond and ultimately defend themselves from an attack is important for identifying ways in which these pests can be managed. "Understanding the mechanisms involved in the early stages of feeding may provide information on how we can stop the aphid in its tracks and prevent virus transmission" contributes Professor Saskia Hogenhout. The green peach potato aphid causes global problems for agriculture and growers, not only directly damaging plants but also acting as a vector, spreading damaging plant viruses. This pest pierces only a small number of plant cells, in order to access the plant's sugar and nutrient supplies. Understanding how the plant mounts a defence response is important for understanding how we might overcome the damage done by aphids in the future.